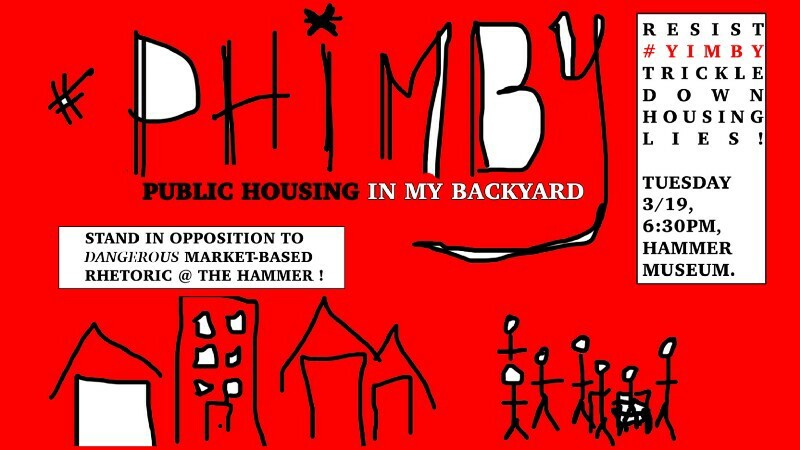 This statement is from a group of organizers associated with the LA Tenants Union, DSA-LA, and/or the Anti-Eviction Mapping Project, in response to an event hosted by the Hammer Museum in Los Angeles on March 19, 2019 titled “The Growing YIMBY Movement.” We also organized a protest inside/outside of the event. As Angelenos committed to housing as a human right, we are disappointed that the Hammer Museum would provide a fawning and uncritical platform to Sonja Trauss and other spokespeople of YIMBYism. It is not simply that we disagree with their ideology, or recognize it as an astroturf campaign; YIMBYs undermine the true movement for housing justice and tenant power. “Yes In My BackYard” advocates a deregulatory, trickle-down framework for housing policy that does more harm than good. The thread uniting YIMBYs is that we should just “build baby build” to solve our housing crisis, despite abundant evidence — including studies by MIT academics and the Federal reserve, in addition to historical evidence from cities that have pursued this approach — showing that merely adding market-rate supply does not lead to lower housing prices, but rather spurs gentrification and displacement. By empowering the real estate industry, which has long served as a vanguard of structural racism and segregation, YIMBY policies hasten the construction of cities only accessible to the rich. YIMBYs view the nightmares of housing and homelessness as a matter of supply and demand, ignoring the basic human right to shelter. Indeed, what they don’t fight for speaks volumes. YIMBYs do not support communities of color that have been fighting a permanent housing crisis for decades. YIMBYs do not support empowering and protecting tenants through policies like right to legal council, just-cause eviction, and rent control. They overwhelmingly ignore the possibility of increasing supply with public or social housing. They do not support redistributions of power and wealth. Fundamentally, they are not on the side of the working class and people of color, and they are not guided by a commitment to housing as a human right. They have also been notably quiet on the subject of vacancy and speculation. They continue to ignore that there are 100,000 vacant homes in San Francisco and 268,000 vacant homes across the L.A. metro area. These staggering numbers can only fail to be relevant to those who are steadfastly committed to housing as a profit-making commodity. Their deference to the free market is why someone like Ben Carson, Secretary of HUD in the Trump Administration, feels comfortable enthusiastically declaring himself a YIMBY. With advocates in the Trump White House, the Governor’s Office, and the chair of California State Senate’s Housing Committee, the YIMBYs are not at all a “grassroots movement,” as the Hammer event ridiculously describes them. From the beginning, YIMBYs have benefitted from robust funding from the tech and real estate sectors. In 2015 Yelp CEO Jeremy Stoppelman helped get YIMBYism off the ground with a $100,000 donation to a Sonja Strauss-led group. According to a more recent investigation by In These Times, among the YIMBY PACs that disclose their donors, over half their money comes from employees of tech or real estate firms. Indeed, last March, the LA Times wrote that “California YIMBY has raised more than $1 million and has a registered lobbyist on its payroll. The group hopes to collect another $1.5 million this year, Hanlon says. He estimates that about 90% of the money has come from technology executives.” This was reported before a $1 million donation from the tech company Stripe. Despite occasional claims to the contrary, YIMBYs do not support the burgeoning tenants movement, and do not take the problems of gentrification seriously. Last year the YIMBYs relentlessly pushed the upzoning bill SB 827 in the face of vehement statewide opposition from tenants groups and anti-gentrification organizations rooted in communities of color that were arguing the bill would intensify displacement. This year, they are again allying with anti-tenant groups like the California Apartment Association (the landlord lobby who have been leading the fight against rent control in California for years) and various Chambers of Commerce to push essentially the same bill. Prop 10 is another good example. This was a massive priority for tenants and the biggest push for an expansion of rent control in California in decades, yet the YIMBYs were nowhere to be found. Instead, they ignore or downplay the need for tenant protections with their laser-like focus on increasing market-rate supply. Sonja Trauss, the invited speaker to this event, has gone out of her way to represent the most nefarious qualities of the aggressively anti-poor, anti-immigrant, and anti-POC mindset of YIMBYism. She has claimed that gentrification is actually a net good for urban land equity because it’s “the revaluation of black land to its correct price.” She has also cited Edward Banfield, who popularized racist ideas like culture-of-poverty theory and broken-windows policing, as a “huge influence.” Even worse, Trauss has has compared Latinx anti-gentrification activists fighting to block luxury development in their neighborhoods to Trump supporters who demonize immigrants. YIMBYism is a dangerous ideology that is funded by the powerful to serve the powerful. We, as advocates for tenants (not housing units), for the human rights of working, poor, and people of color, must push back and provide alternatives to their narrow views. We hope this statement and our action does so, and invite you to join us.